Military service was a customary inescapable, part of life for most Romans in the Republic and Empire, a few commanders stand out, either for saving the state or for transforming the armies. Some went on to civilian life, usually with disastrous consequences. 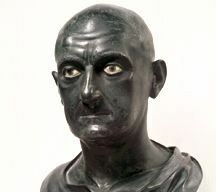 Scipio was only 25 years old when he was given command of the Roman armies in Spain. Facing an invincible Hannibal in Italy, the republic had decided to attack Hannibal’s base, but the first roman army sent to Spain was defeated and both commanders killed. they were soon avenged. Scipio captured Cartagena the Carthaginian headquarters, in 209BC. The next year, he defeated Hasdrubal, Hannibal’s brother, by using light troops as a screen for heavier legions. Soon all of Spain went over to Rome, while Hasdrubal was later defeated in Italy. Counsul in 205BC, Scipio then led an army to Africa and defeated Hannibal at the battle of Zama in 202BC, overcoming Hannibal’s war elephants by ordering his legionaries to open ranks and let the maddened animals pass between them. Scipio made two significant military reforms. First, his armies in Spain adopted the Spanish short stabbing sword. Devastatingly effective, it becomes the standard weapon of the Roman legionaries. Second he reformed the maniple, of which there were 30 to each legion, at times allowing then to act in three separate lines. More than a mere soldier, Scipio was among the first Romans to appreciate Greek culture and to learn the language properly. Partly because of this, he was subject to persecution by Roman traditionalists such as Cato the Censor. In 190BC, he was accused of misappropriating booty from the Syrian campaign, he finally withdrew from public life altogether. A great soldier but disastrous politician, Marius came from an equestrian family. He made his fortune as a publicanus (tax-collector), and he was tribune of the plebs in 119BC, and praetor in 116BC. He was appointed commander of the armies in Africa in the wars against King Jugurta. Brilliantly successful, Marius became consul in 107BC, and finished the war in 105BC and was mad consul again the following year. Marius was given sweeping powers which he used to reorganize the army, introducing the cohort of six centuries(500-600 men) and giving each legion its silver eagle, which soon became a symbol of great importance. He made the pilum, the throwing spear, break at its neck, to render the enemy’s shield useles. Marius abolished the last property qualifications so making the army more attractive to the poor, who now had to carry all their equipment hence their nickname “Marius mules”. These soldiers looked to their general, not the Senate, for reward. Marius used his remodeled army to crush barbarian armies. When he returned to Rome, Marius got entangled between the struggles of the populares, who he supported, and the conservative optimates, and fled from Rome when Sulla marched on it. He finally returned to Rome totally illegally, at the head of an army in late 88BC. Becoming consul for the seventh time, he slaughtered his opponents before dying in 87BC. Although Mariushad shown that military competence did not lead to a successful political career, his political career was nevertheless unprecedented at this time. Despite the rules of the constitution, he had been consul seven times, five of them consecutively. An optimate, or senatorial reactionary, Sulla came from an old but impoverished patrician family. Appointed general by the Senate for the wars against Mithradates of Pontus in 88BC, he used his army to march on Rome and expel the populares, the first military intervention in Roman history. He marched on Rome again in 82BC with a devoted army of 100,000 men. The proscriptions that followed became notorious. Sulla executed 40 Senators, 1,600 equestrians (knights) and many other citizens, giving their lands to his veterans. 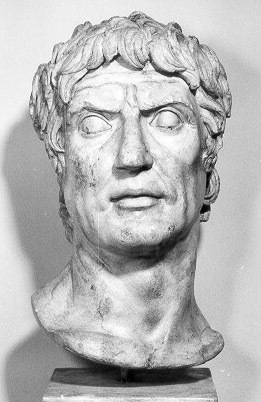 To enact his revolutionary program, Sulla became perpetual dictator. He Passed measures that robbed tribunes of their powers, removed courts from the knights control and issued new treason laws. All this was done to boost the powers of the Senate, which he expanded to 600 men. Behaving in many ways like a monarch, Sulla inaugurated a huge building program, repaving the forum and building the Temple of Capitoline Jupiter, he suddenly resigned all power in 80BC and retired, dying a year later. His settlement at once began to collapse, his career serving as both a warning and an example to later Romans. Augustus greatest general and later his son-in-law, Agrippa came from a modest family background but from 44BC he was Octavian’s closest companion and his indispensable military adviser. He was responsible for building and commanding the fleet that defeated Sextus Pompeius at Naulochus in 36BC, and for defeating Mark Anthony’s much larger fleet at Actium in 31BC. He did this by using Liburnian galley’s which were smaller and much more maneuverable than the big quinqueremes in Anthony’s fleet. In 33BC Agrippa accepted an aedileship although he had already held the consulship, the top post. In effect he became Rome’s first water commissioner, he erected the first public baths, supervised the extension and rebuilding of the cloaca maxima, the ancient drain of Rome, and built an artificial reservoir, or stagnum. Later he built a network of roads across Gaul. After Marcellus death, Agrippa married Julia, Augustus only daughter, and their two sons Gauis and Lucius became Augustus official heirs. Agrippa died on March 20 12BC, one of the finest generals and ministers who had helped transform the Republic into an Empire. The younger son of Livia and the stepson of Augustus, Drusus was the descendant of some of the proudest patricians in Rome and like his older brother Tiberius, he was a formidable general. He first won military fame campaigning in Illyria. after the death of Agrippa in 12BC, although still in his early twenties, he was entrusted with the steadily advancing conquest of Germany. Drusus crossed the Rhine and invaded northern German, conquering territory up to the Elbe River, which was designated as the new frontier. It is said that he longed for the spoila optima, the highest military honors awarded to those who had killed an enemy commander in person, and so rode around the battlefields in search of German chieftain to be his victim. This was probably slanderous, but he was certainly ambitious. In 9BC Drusus ambitions were curtailed by his early death in riding accident. His deth deprived the Julio-Claudian dynasty of a good general who was less morose and suspicious than his elder brother. It also deprived those senators still hoping for a republican restoration, for Drusus according to Tacitus, was believed to be a secret republican. he had married Antonia, the daughter of Mark Anthony and niece of Augustus, and they had two sons, Germanicus, who became a popular general, and the bookish Claudius, who later became Emperor. Germanicus was the charming and popular son of Drusus and great-nephew of Augustus, he grew up partly among soldiers. 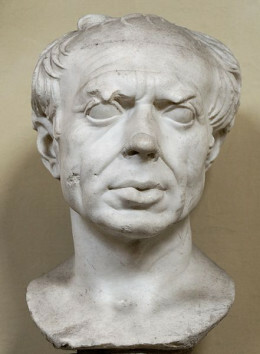 Unlike his infirm brother Claudius, he was marked out early both as general and the successor to his fathers reputed republican sympathies. By the time Tiberius became emperor in 14AD, Germanicus had been appointed by Augustus as commander-in-chief of the Rhine forces, and Tiberius had had to adopt him as his son and heir. At eight legions, the Rhine command was much biggest in the army. Many of the legionaries had mutinied, and Germanicus restored order only with great difficulty and at peril to his own life. He led his armies into Germany, where Varus had lost his life and three legions in 9AD. Germanicus buried some of the bones of the dead legionaries and defeated the German leader, Arminius, in a minor victory. However, Tiberius had no intention of resuming a forward policy, and in 16AD Germanicus was recalled. Tacitus has him say “I achieved more by diplomacy than by war…as the Cherusci and other savage tribes, Rome’s vengeance has been asserted and we can leave them to quarrel among themselves”. This proved true. In May 17AD Germanicus celebrated a triumph in Rome, then became consul with Tiberius before being sent to sort out problems in the east. On the way he visited Egypt, thereby arousing Tiberius wrath, for senators were prohibited from Egypt without imperial permission. In Syria he soon quarreled with the new governor, Gnaeus Piso. When Germanicus died at Antioch on October 19 AD, it was rumored that Piso had poisoned him. Whether scapegoat or villain, Piso was tried for murder and he commited suicide soon after. Germanicus left three children by his wife Agrippina, Augustus grand-daughter, of whom one survived to become emperor: Caligula, the vile antithesis of his charming father. One of Rome’s finest generals Agricola was fortunate in having the historian Tacitus as his son inlaw to laud his life and career. Born in AD40 at Forum Iulii (Frejus), Agricola’s father was a senator and his mother a cultured woman who sent him to Greek schools in Marseilles. He first served as military tribune in Britain under Suetonius Paulinus (AD58-61). As quaestor to Salvius Titanius, governor of Asia, he was shocked by the “mutual covering up of malpractice” among officials. After holding office in Rome, he returned to Britain as a commander. Governorship of Aquitania (southwest France) was followed by consulship under Vespasian. When he became governor of Britain (AD77-83), Agricola, under ordersfrom Rome, decided to complete the conquest of Britain. He first subdued Noth Wales before overawing the Brigantes in 79AD by sending two military columns on either side of the Pennines. He continued north into central Scotland, reaching the Tay. In 82AD he turned southwest, conquering the corner of Scotland and glimpsing Ireland, which he optimistically thought it could be conquered by a single legion. In 83AD he continued north along the eastern edge of the highlands, building forts as he went. Finally, in 84AD he met the gathered Caledonian clans at Mons Graupius, perhaps near Inverness, defeating but no annihilating their forces. He then ordered the building of a major legionary fortress (for more than 5,000 men) at Inchtuthil above the Tay. But the emperor Domitian, suddenly needing troops for the Danube, recalled a legion and the conquest had to be abandoned. “Britain was completely conquered and immediately let go” was Tacitus bitter comment, but the highlands would have proved very difficult to conquer and hold. Agricola was also a great peacetime administrator. He built over 1,300 miles of roads and 60 forts repressed abuses, notably in the tax collecting system, was lenient towards minor offences but hard n major ones, and encouraged the Romanization of Britain. According to to Tacitus, he encouraged individuals and communities to build temples, fora and houses, had leading Britons son educated in the liberal arts the result was that people who had rejected Latin now sought to be fluent and eloquent in it. Such eloquence was a vital Roman civic skill and spurred the development of a true Romano-British aristocracy. Agricola had no further important commands under the increasingly paranoid emperor Domitian, but at least he kept his life.